I was very pleased to be quoted in an article by The Times Environment Editor, Ben Webster, on Saturday (10th March 2018), which revealed how meat and milk labels used by food producers and retailers, often hide the fact that food is produced from animals that never go outside. A key driver for me starting to talk about the concept of free range milk, was the frustration I felt, at the abuse of a widely held perception that all cows are free to roam in fields in the spring and summer months. Images of cows grazing in lush pastures were (and still are) commonplace on milk labels and in the dairy aisles and yet, more and more farmers are being driven to build bigger herds and permanently confine cows, under a more intensive production regime, in an attempt to combat relentless pressure to deliver more for less. The NFCU website goes on to say “Food fraud becomes food crime when the scale and potential impact of the activity is considered to be serious. This might mean that the criminal activity has cross-regional, national or international reach, that there is significant risk to public safety, or that there is a substantial financial loss to consumers or businesses. Clearly the full extent and impact of food criminality may not be immediately apparent when information is first received”. No wonder then, perhaps, that the animal welfare organisation, Compassion In World Farming (CIWF), is calling for clear information about farming systems to be included on food labels. Some in the farming industry believe that the system of production is irrelevant in determining animal welfare and that we should focus, instead, on promoting measurable welfare outcomes. However, attempting to present such information to consumers is likely to create further confusion and the assessment of welfare of dairy cows, for example, on the basis of the incidence of lameness and mastitis in herds, fails to provide a full picture of the life of cows on farms and a hollistic assessement of their wellbeing. Whilst I would not claim that simply providing cows with the freedom to graze in fields for six months a year, gives a clear guarantee of good welfare (management plays a key role to safeguarding welfare in all systems), I believe freedom is a good place to start. The Times article carries a quote from me that sums up what Free Range Dairy Network is all about – “Grazing is a fundamental expression of natural behaviour for dairy cows”. In simple terms, if we develop farming systems that give animals something akin to the life that nature intended for them, we create more opportunities for good welfare. All farmers who are members of our scheme are also required to be Red Tractor assured, which provides an overall assessment of farming practices. But there are vast range of farming systems producing milk and currently people have no way of identifying them on the supermarket shelf. The food choices most of us make are often driven by far stronger forces than ethics and this is, in part, why so many farmers are struggling to keep their businesses going. 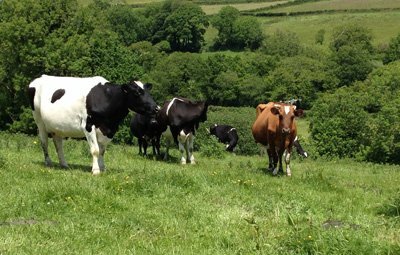 Allowing shoppers to choose milk and meat on the basis of its true value, rather than its price, is key to reviving the fortunes of small, family farms and labelling the method production offers an urgently needed identity for those farms. If any producer is against declaring their methods of production on food labels, we need to ask why. The Pasture Promise logo is a method of production label, representing a defined farming system that puts freedom for cows first. When you see the logo on milk and dairy products, it provides you with a clear assurance that they are produced from traditional, pasture-based herds, where cows are assured the freedom to graze in fields for at least 180 days a year. Labelling this free range method of production is key to redressing the balance of power in the dairy supply chain and helping farmers to reclaim the value in milk that is rightfully theirs. Please help us to make a difference for farmers and cows, by asking for the Pasture Promise logo wherever you buy milk.